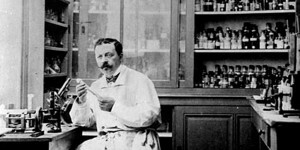 Marcel Mérieux, a student of Louis Pasteur (Institut Pasteur), establishes Laboratory Marcel Mérieux in Lyon, France, specialising in microbiology. Dr. Charles Mérieux takes over his father’s laboratory. Charles Mérieux creates the French Institute of Foot-and-mouth Disease amongst the Lyonnaise abattoirs and then the Mérieux Institute. A department of Medically Assisted Procreation (MAP), focusing on couple’s infertility is integrated into Laboratory Marcel Mérieux. First application of the Polymerase Chain Reaction (PCR) technique, discovered at the end of the 80s, for infectious diseases (Virus, bacteria, parasite screening). Development of PCR technique for application in molecular biology. Creation of the Genetic Fingerprinting Laboratory whose mission is to establish genetic profiles for the French Justice System. Merger of Laboratory Marcel Merieux and Laboratory Claude Levy to form Biomnis, French leader in specialised medical pathology. Creation of the onco-haematology department, dedicated to the pathologies of malignant haemopathies and solid tumours. Development of the first therapeutic markers, notably KRAS for colorectal cancer and HER2 for breast cancer. Biomnis offers new oncology markers: HE4 and Roma score for early diagnosis of ovarian cancer, Septin 9 and [-2] proPSA & Phi index respectively for non-invasive screening of colon and prostate cancers. Development of NGS technique (New Generation Sequencing) enabling the sequencing of hundreds of thousands of DNA fragments for the diagnosis of genetic diseases. Biomnis develops an innovative, specialised new test for women via its new screening marker for pre-eclampsia in the 1st trimester of pregnancy. Mass Spectrometry as chosen method for immunosuppressant drug testing and the therapeutic monitoring of transplanted patients. With over 400 specimens tested per day, Biomnis laboratories is placed n° 1 in Europe for the testing of these immunosuppressants by LC-MS-MS.
Biomnis Laboratories joins Eurofins Group, global leader of bio-analytical testing. Performance of new companion diagnostic tests for personalised medicine in oncology, enabling chemotherapy dose adjustment (5-FU). Hello, I invite you to consult the site www.biomnis.com, on page History https://www.eurofins-biomnis.com/en/biomnis/history/ Best regards.